Our supplemental services are provided to our weekly maintenance customers to help aid in and enhance the development of their lawn. We will first preform a professional turf assessment which may consist of a soil sample to provide our customer with a good understanding of what needs to be done to meet their expectations. CORE AERATION: Soil aeration is the process of using equipment to puncture the soil to remove approximately 1" x 2" cores of soil from the ground. Aeration may be overlooked when trying to restore a lawn but is vital to bring it back to health. It improves drainage and reduces puddles formation. DETHATCHING: Thatch is a build-up of organic matter which can include dead grass, leaves, stems, stolons, rhizomes and overcrowded grass roots and lateral weed growth. Thatch can stifle the growth and health of grass or turf. Removing the thatch helps the grass by encouraging it to thicken up and also makes it stronger and less susceptible to disease. Reducing thatch levels increases the levels of water, air and nutrients that can get through to the root zone of the grass plants. Significant thatch problems in lawns can cause diseases and can encourage moss to grow in the areas where grass has died. OVERSEEDING: The planting of grass seed directly into existing turf. It's an easy way to fill in bare spots, improve the density of turf, establish improved grass varieties and enhance your lawn's color. Turf is not infinite, and parts of it will die out each year so staying behind this natural occurrence by over-seeding every year will aid in keeping your lawn healthy. 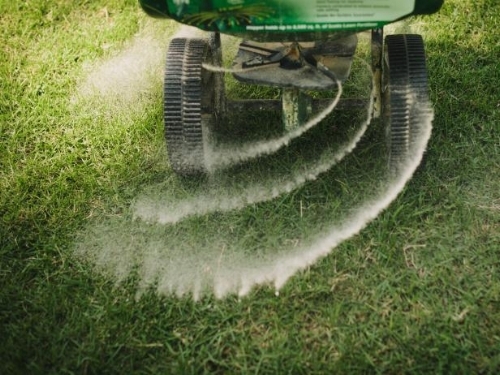 FERTILIZING: Keeping a lawn properly fertilized is key to a well-established, weed free green grass. When a lawn is thick and lush, not only does it look great, but it also acts a natural weed barrier by not allowing much sunlight to reach the soil and therefore new weed growth. While keeping your lawn fertilized for this reason you will also benefit from the enhanced curb appeal of your property, sometimes even increasing resale values. We recommend taking an annual soil sample to ensure the proper amount of fertilizer is applied to your turf, as too little or too much can be harmful.